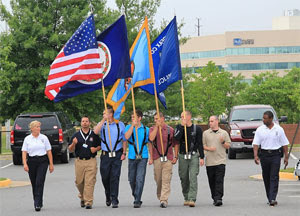 The Fairfax County Police Department Honor Guard will be hosting a three-day training seminar June 25, 26, 27th, 2012. Attached is the seminar registration form and course outline for your review. This will be our seventh seminar. We have received very positive feedback from all attendees. Classroom instruction will provide demonstrate how to prepare a line of duty death Teletype Message (TTY) and produce an Honor Guard budget. Mr. Chris Cosgriff, Executive Director of the Officer Down Memorial Page (www.odmp.org) will give a presentation on ODMP on day one of the seminar. 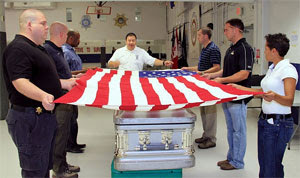 On day three the class will go to a funeral home/cemetery to practice a mock line of duty funeral. A small fee of $175.00 per student supports the costs of hosting the seminar. Each student will receive a copy of FCPD's Honor Guard SOP. 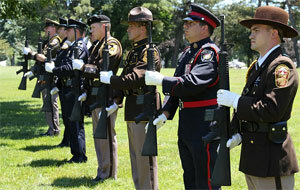 We have been told the SOP is one of the best written for LE Honor Guards most have ever seen. There will also be a barbeque dinner on the first night which is included in the registration fee. The class size is limited to forty-eight students and is on a first come first serve basis. The class generally fills up in less than a month. Enrollment is limited to four students per agency. Once Lt. Baine receives your registration form and payment he will send you an e-mail confirming your team members are enrolled. The seminar partners with Staybridge Suites if you are traveling in from out of town. This is a very nice hotel and their rooms have full kitchens. The hotel serves a hot breakfast daily. The rate is $155.00 per night for a king or two double beds, which is below the GSA room rate for this area. We encourage all attendees from out of town to stay at this hotel due to its close proximity to the training academy. The hotel provides a shuttle service to and from the airport and we can provide a shuttle from the hotel to our training academy if needed. The hotel has blocked rooms at this special rate two days on each end in the event you wanted to come early or stay later for sightseeing etc. Click here to make your reservation: Staybridge Suites Chantilly Va.